I went to Eugene for the weekend a few weeks ago, for the first time in close to 20 years. I spent 5 years working and going to school there a long time back while at the University of Oregon, so I knew it fairly well then, but hadn’t kept up with much of anything since. Most of my time this trip was either spent with friends or just walking around. Of course a ton had changed since I was there last. Still, knowing that and seeing the changes are different things. Little Free Libraries as such, for example, weren’t around then. 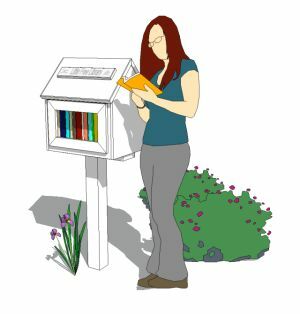 You’d see a small shelf of books and games for anyone at a bar or coffee shop, but not the Official Little Free Library movement there is now. This trip, I also dropped a few books off in the LFLs I found via BookCrossing. On the first day, a friend and I went out to Lane Community College to find the Art-o-mat machine. It’s a refurbished cigarette machine from the 60s/70s/80s that now dispenses cigarette-pack sized art. This is one of three in the whole state of Oregon. The machines are stocked with all sorts of art, from poetry to ceramic or wire sculptures, glass pieces to mini-notebooks, photography to jewelry, paintings on mini canvases and lino prints and everything else that could possibly fit in a box the size of a pack of cigarettes. Everything sells for $5 each. This one was located, appropriately, in the community college’s art gallery. I love everything about Art-o-mats – I love that the cigarette machines are getting new lives, I love that they sell affordable and easily stored/displayed art for the masses, I love that Art-o-mats works with individual artists – famous and not – and art collectives such as teen programs, I love that you only get the barest bit of information from the tags on the machine – it’s a bit of gambling. I collect the pieces – I have around 30 pieces right now. Here’s what I got this trip: A woodland scene made from paper piecing (there’s even a cardstock easel on the back to stand it up), a painted block with a heart in a speech balloon, hand-drawn pen art with typed words on paper strips done by a teen, and a word made from photos, plus all the packaging the pieces came in/with. Once done with the Art-o-mats, we tracked down the Little Free Library right outside the community college’s preschool, #18400. It’s even got its own page on the Lane Community College website! I don’t know why it was so empty. Maybe they empty it for weekends and just have books in it when the preschoolers are at school. The next day, I was on my own. The Little Free Library map is kind of unwieldy even on a regular-size computer, and downright useless on a smart phone. Fortunately for me, I also had access to the Little Library Locator app – really, a website – to help me find the LFLs near me as I walked. The weather was beautiful, the trees still green and super-leafy, and there was hardly any traffic as I started out on this early Saturday morning. The first one I stopped by was LFL #5083. It reminds me of books and materials we used to build for the preschool kids where I worked in the late 80s/early 90s at the UofO childcare centers. Next up was was LFL #10252. Again, not too many books, but a lovely little yard. I’m pretty sure this is near one of the apartments I lived in while going to school. I never did find that apartment building on this trip – it’s entirely possible it’s been torn down to build a higher density apartment building or a business. Further down the street was LFL #10465. Such a pretty yard! Also, a well-stocked LFL! I took one book from this library. I met one of the neighbors as I walked. Very friendly, not much of a talker. I tried to find LFL #4202 – especially because of its low number – but it’s not there anymore. So I sat at the park across the street for a bit to log it’s absence in the Little Library Locator, enjoy the trees and fall leaves, and to decide which direction to go. I passed a couple of garage sales, some nice yards, a few more cats, and this ski lift chair mounted on someone’s porch. I love it! Last one for the day, LFL #21177. Easily tied with #10465 for the best stocked LFL I saw the whole trip. I think I took two books from this library. After that, much catching up over dinner with friends, some well-deserved reading time in my motel, then back home I went. The nice thing about taking the train – I got to read the whole way home! I walked past a Little Free Library on the boundary of the Brentwood-Darlington and Woodstock Neighborhoods in Southeast Portland today, #45498. It’s a very trusting library, tucked into a tall hedge on the corner of SE 45th & SE Ogden. I’ve been by this LFL before. I don’t pass by it often enough to know how well it’s patronized, but I’ve seen all sorts of books, I’ve seen it full and nearly empty, and it’s always in good shape – the stewards are clearly taking care of it. Sometimes I’ve seen bookmarks. Today, there were also an Amnesty International and a Pink Ribbon/Cancer Awareness vinyl clings. I wonder how much traffic it gets, being rather near some good neighborhood shopping and an elementary school. I didn’t see any books I wanted to take home today (trying to work through my To Be Read pile!). I’ll try to remember to take a few books their way next time I’m in the area. 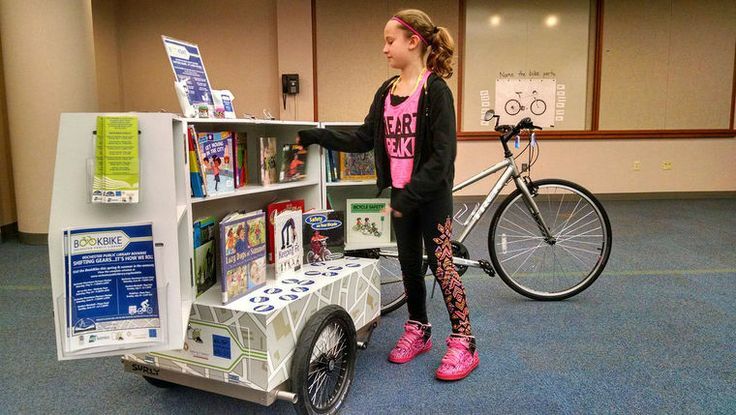 Check out these bookcycles and bibliobikes! While I’ve seen lots of photos and read about traveling libraries, I’ve never actually seen one. Have you? 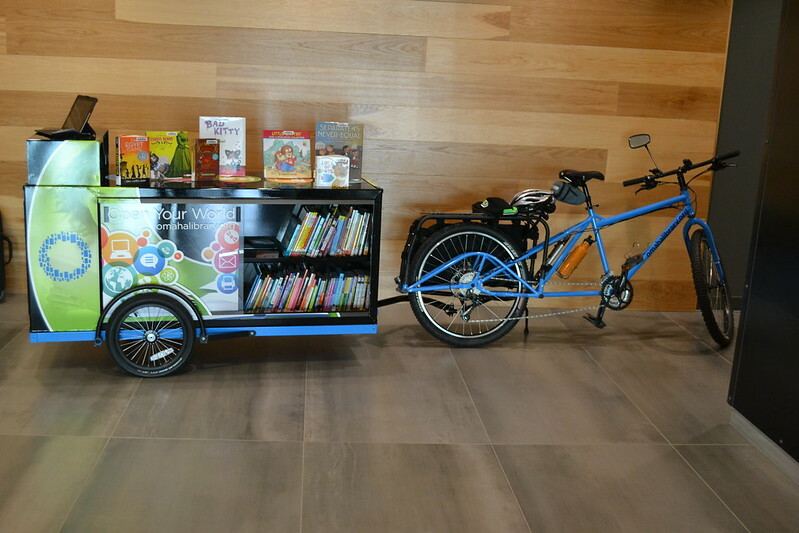 Why mobile libraries? Because this, this, and this. Donkeys, buses, vans, boats, they also work to get books where they are needed. Sometimes European nobles would bring along a box of books on a journey – Napoleon brought his own library along during military campaigns. Traveling libraries were especially important to lighthouse keepers as well. Check out playwright/author Tom Stoppard’s more modern version of the book box. Things to consider before starting your mobile library – who do you want to serve? where will you source your books? how will you fund your library? how will you deliver your books? where will you store them when not out and about? 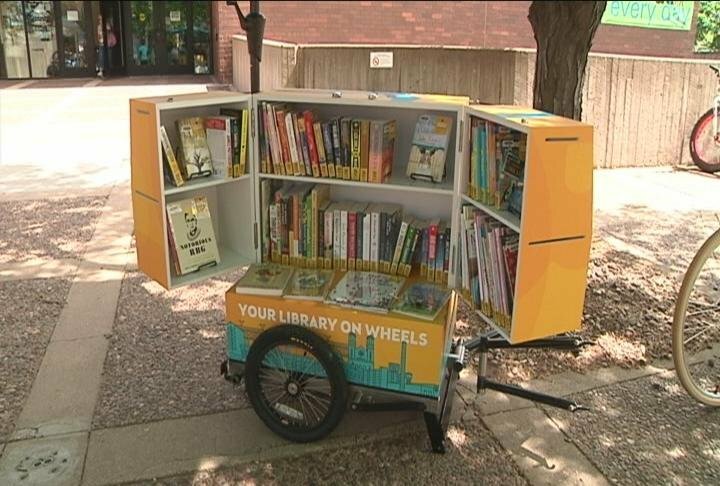 Yes, Little Free Library supports mobile libraries! Including the kind you can carry by hand! 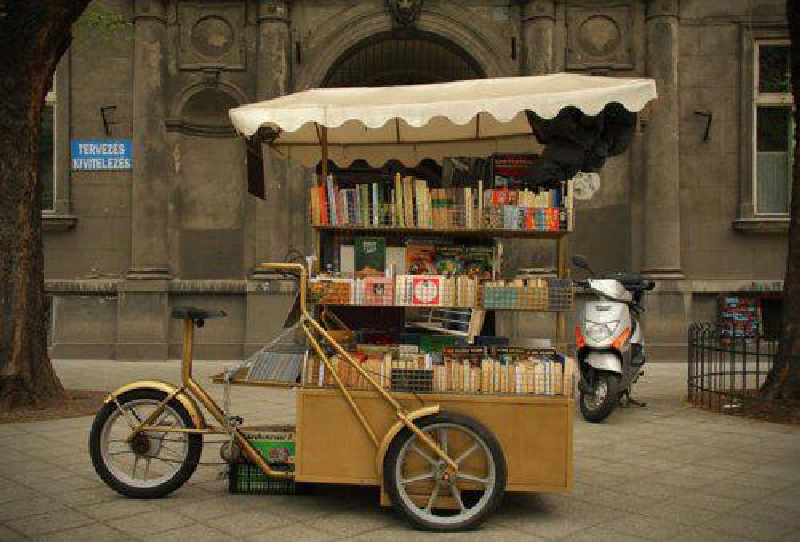 Read this only if you seriously want to nerd out on starting a mobile library. 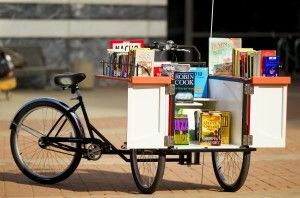 Read more about the history of traveling libraries – Library on Wheels, Library History Buff, and A Field Guide to Mobile Libraries. And more pictures of traveling libraries through history! Vintage photos of bookmobiles, more modern mobile libraries, some extraordinary mobile libraries, and tons more on Pinterest. 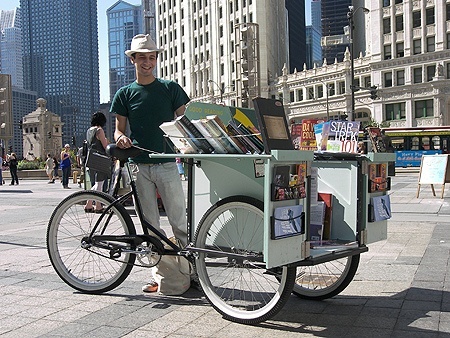 I’d love to hear about any mobile libraries you’ve seen or read about! I went for a bike ride earlier tonight, and visited two Little Free Libraries. The first, #36705, at about SE Grant and SE 78th, I left a handful of books but forgot to get a picture of. I did pick up a couple of books, though! I picked up “Why Do Clocks Run Clockwise?”, by David Feldman, and “The Language of Baklava”, by Diana Abu-Jaber. I hope with their proximity to Portland Community College, as well as being in a rather walkable neighborhood (once you get a little further away from the College), that they get a fair bit of foot traffic. Then I rode over to #43877, at about SE Center & SE 74th. So cute! It’s a miniature version of the Stewards’ house! It’s one of the smaller LFL’s I’ve seen, in terms of space for books. I didn’t pick any books up here, but I left a few. They have both a webpage and an instagram.